Article by Margaret P. Creedon, Ph.D. titled "Autism and Sight or Hearing Loss: The Diagnostic Challenges of Dual Disorders." This practical guide demystifies the research about biochemical abnormalities in individuals with autism and provides authoritative nutritional recommendations for addressing the medical symptoms associated with Autism. Many individuals on the spectrum have difficulty adjusting to the reduction in daylight hours as well as the colder outdoor temperatures in the Fall season. We encourage family members and professionals to be sensitive to such changes and to provide the necessary support needed to make such transitions as smooth as possible. With the major year-end holidays around the corner, we want to acknowledge the everyday efforts of individuals on the spectrum as well as families and professionals in our Network who tirelessly continue to navigate the rather constant and complex environmental, educational, and vocational challenges. Bullying has become a national concern and is often characterized as repetitive teasing along with threatening and demeaning actions. These actions may also include verbal and physical aggression. Bullying usually heightens one's anxiety and leads to feeling unsafe in one's own school. Bullying and harassment can be hurtful and considered criminal whether or not the target person complains. Some students with ASD may even be coerced or reinforced for bullying others. Not surprisingly, there is little research on bullying those individuals on the autism spectrum who are also deaf/hard of hearing and/or blind/visually impaired. It is worrisome that a recent British study found that 7- to 8-year old neurotypicals who simply wore prescription glasses were 40% more likely to be physically abused than those who did not wear glasses. There are many other ways that a student with a sensory-based disability could be labeled as "different" in a school setting, such as wearing different colored glasses, relying on an electronic device to communicate, and wearing a hearing aid or cochlear implant processor. Incidents challenging the existence or extent of a very sensory-based disability continue to occur. We have heard bullying reports involving the breaking of communication devices, spinning the person around in circles, screaming negative comments, and even shining bright lights in their eyes. Differently-abled individuals should be prepared to interact with other students who likely have a poor understanding of the situation. A component of any child's safety plan, or an IEP goal, should include realistic and appropriate expectations on how others might behave toward them and how best to respond. It is also important to mention that many special education policies, along with disabilities law, consists of guidelines and consequences for offenders. Staff, parents, and students should be aware of these laws and policies. Since schools work to ensure students participate in least restrictive and more inclusive school settings, all students need to know ways to report bullying behavior. It is critical for students to have access to the appropriate vocabulary while using their alternative and augmentative communication systems and a "safe" person to tell. Sunny was born in South Korea and is blind. She was adopted by her family in the United States at 2 years of age and graduated from Maryland School for the Blind. Sunny also has Asperger Syndrome. Sunny plays keyboard in the Praise and Worship band at her church. She also performs at local nursing homes. Since 2011, she has given speeches and piano performances at Sensory Friendly Concerts™. 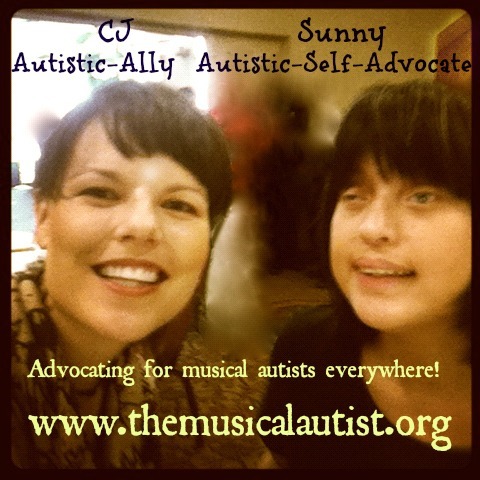 Sunny, along with Christy Joy (CJ) Shiloh, co-director of Musical Autist and a Board Certified Music Therapist, often present talks and perform together to support the mission of Musical Autist. The mission is to provide "equal rights to the fine arts," and to create "avenues for self-advocacy" at autism and music therapy conferences. Both Sunny and CJ spoke recently at the 2013 Autism Society of America conference in Pittsburgh. Sensory Friendly Concerts™ fall within the category of "Community Music Therapy." CJ Shiloh is currently working on a research project through Colorado State University to assess the benefits of Sensory Friendly Concerts™ for individuals with disabilities as well as families members and the community as a whole. Individuals on the autism spectrum can hear great music at these Sensory-Friendly Concerts™ in an accommodating and respectful environment. Individuals are also invited to perform and share their own music at these concerts. For more information about Musical Autist and their concert series, visit: www.TheMusicalAutist.org. A new exciting feature integrated into the new operating system, iOS 7, for iPhone, iPad, and iPod touch is the switch control feature. This was designed for people with low vision, blindness, reading disabilities, dyslexia, and other disabilities. This feature is intended for users who may have difficulty navigating the complexity of their Apple touch screens. The switch control feature can be activated by a connected switch, such as a blue tooth device, or the integrated "gesture switch" that utilizes the built-in camera to monitor head movement. The switch control can be programmed to activate certain apps, such as Siri and volume control (higher/lower) simply by turning one's head to the left or to the right. The switch control function can also highlight app icons on the screen in a sequential order. The user simply moves his/her head to select an app or to select an option within an app. The user also has the option to control the length of time each icon is highlighted before moving on to the next icon. These are just a few examples of the new switch control feature. You can simply conduct on online search of the words "iOS 7 switch control accessibility" to learn much more.